I was expecting this book to be simply about the murder of Albert, “Bert,” Massey at the hands of his maid, Carrie Davis, who shot him in cold blood after he made a sexual pass at her. The book however unravels to tell a story of Toronto in 1915, a rapidly changing city at the height of the First World War. Gray moves carefully through each chapter providing details of the case and trying them to larger trends in Toronto. The first half of her book deals largely with Victorian sensibilities regarding women, something that I have always found interesting. The late 19th and early 20th centuries saw a rise of reform movements, most notably for suffragettes, women campaigning for the vote. Upper and Middle Class white women also campaigned for a number of different causes, including prison reform. Gray deals popular practices in criminology at the time including craniology, as well as the idea that while men committed crimes, women committed sins and could therefore be rehabilitated. The most shocking thing about this case is while even though Carrie Davis admitted to killing Bert Massey, the jury voted her not guilty. Gray details the brilliance of her lawyer, Hartley Dewart, and how he tied Carrie’s case to the War overseas. Carrie as a virgin girl was protecting herself from the advances of her employer, much like British soldiers overseas were defending themselves against the advances of the Germans. He essentially made Carrie an allegory for British values and it worked. Gray talks a lot about the popular opinions surrounding the trial and the ways that the different newspapers in Toronto treated the case. I wish she spent a bit more time tracing the fall out, but she does mention that the case against Carrie Davis did not set a precedent. This book was still great, it’s always interesting to read about places that you are familiar with and reading about Toronto in 1915 as well as seeing pictures was enjoyable. 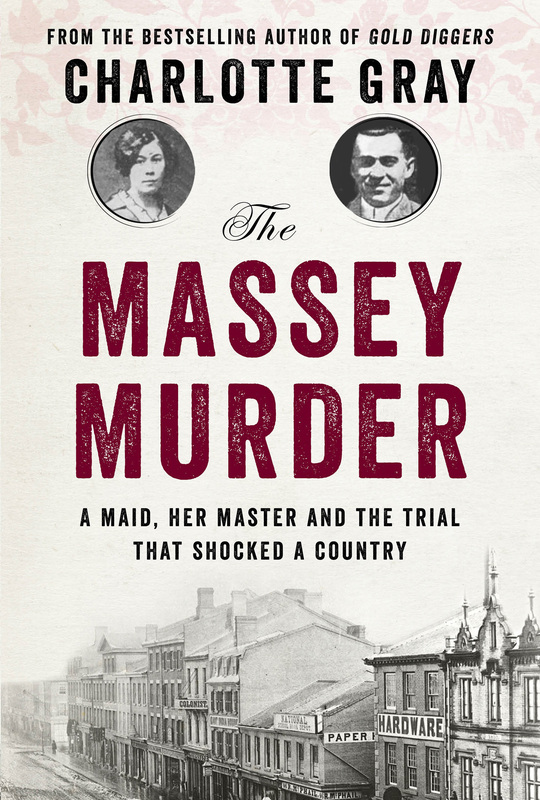 This entry was posted in Reviews and tagged 1915, 19th Century, 20th Century, Canada, Canadian History, Charlotte Gray, Crime, History, Murder, Non Fiction, Review, The Massey Family, The Massey Murder, Toronto, Victorian Era, World War One on May 21, 2015 by kwils3. Today was the last day of the One of a Kind Craft Show in Toronto. I wanted to share some of the literary crafts that Sprouts Press Designs had to showcase. In addition to beautiful handcrafted journals, the booth also had these adorable Christmas Ornaments for “Christmas Curmudgeons” all containing pages from Charles Dickens’ works. I also loved the idea of a bookbinding kit which contains all the materials you need to make your own hardbound journal. If that’s not enough, Sprouts Press also offers bookbinding workshops. Check out their upcoming workshops and products on their webpage. This entry was posted in Special Post and tagged bookbinding, crafts, handmade, journals, oneofakind, sproutspress, Toronto on December 7, 2014 by kwils3. This entry was posted in Special Post and tagged Heritage Toronto, Mackenzie House, Toronto, Victorian Christmas on November 25, 2014 by kwils3. Halloween is this Friday and to celebrate I picked my five favourite haunted places in Toronto for the Musings Blog. Did you know that One Toronto Street is located on the site of Toronto’s first hanging grounds? That University College at UofT is haunted by the ghost of a murdered stonemason and to this day, you can still see his axe mark in the door? The next time you’re enjoying a steak dinner at the Keg Mansion peruse through their “ghost log” where visitors have left accounts of their own paranormal experiences, and ladies, make sure to take a friend to the washroom with you. As October 31 marks the day that spirits and ghosts come out to play, be wary when walking around Toronto late at night, you never know who you might meet. This entry was posted in Special Post and tagged Blogging, Ghost, Gibraltar Lighthouse, Halloween, Haunted, History, Keg Mansion, Mackenzie House, Spirits, Toronto, University College on October 28, 2014 by kwils3. Hi everyone, I’ve recently started writing for the University of Toronto’s Museum Studies Blog Musings (It’s a once a month gig where I post reviews about exhibitions in the GTA) Check it out, there are a lot of cool things being written about in the museum world. This entry was posted in Special Post and tagged Blogging, Culture, Museums, Toronto on September 30, 2014 by kwils3.